MCA worked as part of a multi-disciplinary team led by Grant Thornton Consulting. MCA worked as the spatial planners and urban designers to develop a Master Plan for a 200ha site in the Southern Part of the Sultanate of Oman. The site offers good potential to develop a multi-use development that will attract various identified markets. 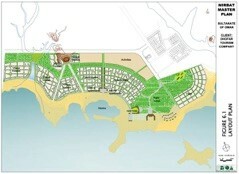 The project focused on developing a tourist destination with the associated facilities; spa, diving facilities, fishing, boating, turtle tourism, camel riding, horse riding, walking, shopping, bird watching and sunbathing and a place to buy a home in a place which offers a variety of choice, a marina, is pedestrian friendly and beaches.